My mother loved books. She read like a demon –– just about anything from history to romances to religious tracts to hard-bitten detective stories. The words “voracious reader” would be an apt description of my mom. She had her own books stashed everywhere and there would always be a pile of 5 or 6 from the library next to her favorite reading chair. She belonged to a book club that met to discuss books (and gossip) once a month. Pretty much everything interested her. Although she was a tiny thing, she was a tireless fighter for what was right and in her 70’s to mid 80’s she worked like a dog to feed the homeless in her town. I’ll never forget the day she called me up, ecstatic that she had snagged a 10-gallon pot for the shelter at a restaurant auction –– she was so proud of herself (I don’t think it ever occurred to her that a civilian could buy professional equipment). All in all, she was a pretty great lady. She did have one addiction –– Time/Life books. We had a million of them in the house when I was growing up... rows and rows of Time/Life Books. I swear, she just couldn’t say no with series like Wars, Nature, Science, The American Indian… you name it, she subscribed to it –– including 2 series on food. I sometimes wondered if she didn't send them back once they started arriving so she wouldn't hurt their feelings –– she was that kind of person. A few weeks ago, I found a Time/Life book on a shelf, looking for something else. Memory is a funny thing. At first I couldn’t remember where it came from. The image on the front of the book was so familiar, but the lock to that door in my brain was rusty. A few days ago my brain released the secret of the book (came to me jogging with Petunia, the St. Bernard). It was one of the cookbooks I brought from my mom’s house when she died. I remember that image on the cover had piqued my curiosity as a child. I couldn’t cook then and wouldn’t even want to try for many years when I looked at it in the 70’s… but that chicken was remarkable… it was like edible art. I was on an Art Nouveau kick at the time and the idea and technique of the design appealed to me (even if it was strictly symmetrical, which my beloved Art Nouveau style rarely was). The thing is, these books are loved by a lot of people today, I was really shocked to find 40 years out they are a cult favorite –– who knew! Time/Life did a few cooking series. One was called The Good Cook, edited by the legendary Richard Olney, and the other series, that my copy of Classic French Cuisine came from –– Foods of the World. Although they were printed in the late 60’s and 70’s, they still circulate like wild on Ebay and Amazon. The full set will set you back hundreds, but single books of Foods of the World are just a few bucks. One word of advice, almost all the recipes are in a companion, ringed book ––very few recipes are in the hardcover book –– that is full of history, stories and photos. The series came in a box that held the smaller softbound book and a larger hardbound book. Very few of the boxed 2-parters are up for sale, most have lost their cases and have been split up… so you may have to buy one spiral and one hardbound from 2 different sellers to have the complete book set –– you can still pull it off for $10. There is a reason they are still so popular –– they are great and were real game changers. Putting it into perspective, in the 60’s (with very few exceptions), most Americans that hadn’t traveled to foreign countries had a very diluted view of their cuisines. Kind of like the difference between a little plaster statue of Michaelangelo’s David and the real deal (ok, that may be exaggerating a tad too much). Chinese was Chop Suey, Italian was the stuff from Chef Boyardi and classic French was gloppy sauces and high prices with things set on fire. These books sought to change that perception and give people an idea of the authentic food of each nation. They are really an amazing series. They enlisted James Beard, Julia Child, MFK Fisher, Jacques Pepin, Waverly Root Craig Claiborne, Pierre Franey and a whole host of contemporary culinary luminaries to contribute to the series and the result was spectacular. For those of us who take food pictures, it is a real eye-opener to see how much food photography has changed! Look, I love new things too, but fashion for fashion’s sake is crazy. The older I get the more I believe it. Just running after each “Next Big Thing” misses so much. There is such a huge world out there to investigate. It spreads far and wide, present and past and it’s all ours to appreciate and experience. Great is great, no matter where or when. These are great and great fun. Putting the Time/Life series into perspective… it was a brave experiment to open the world to a provincial (and slightly xenophobic) American public. Cooking clubs developed around the country to cook their way through the books. If you had already visited the country, they enhanced your memory. For travelers who were visiting the countries for the first time to taste the cuisine first hand –– they had an advantage thanks to the series. Instead of ordering Le Big Mac and complaining the food didn’t taste American, they wanted to try new things and eat the real food of the country –– not tourist food. 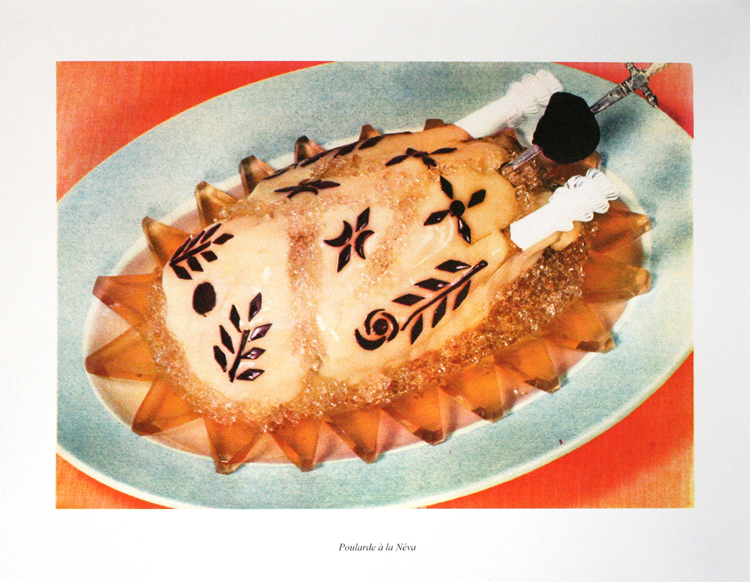 The picture on the cover of the book, Classic French Cuisine (edited by Craig Claiborne and Pierre Franey) that has been locked away in my brain for so many years is of a classic dish called Poularde a la Néva. I never thought in a million years that I would attempt it, but I did! The dish was named for the Neva river in St. Petersburg and comes from the sophisticated cuisine of that place and time… early 19th century. 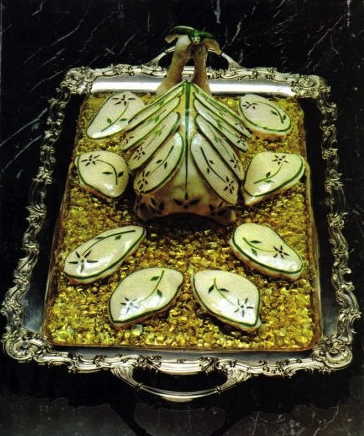 The Russian style worked its way west and into the haute cuisine of France (bringing with it service a la Russe – taking individual plates to the table in courses instead of putting everything out on the table to get cold). Although the original is a whole chicken stuffed with truffled chicken and foie gras mousse and covered in gelée, I thought I would simplify the dish a little. I decided to take few liberties since the Time/Life crew had as well when they added the medallions of meat over the top of the bird and arranged in a flotilla before it. I figured I would just make the medallions of chicken and treat them with the same techniques… glazing them with white chaude-froid sauce, resting them on a sparkling sea of gelatin jewels –– I love the way they look. This isn’t terribly hard (even the cutouts aren’t that difficult to do) but it is time consuming. However, once you have the gelatin made, the rest moves fairly quickly… it’s easiest done over 2 days. This is great with a vegetable rice salad with mayonnaise dressing made with peas and mushrooms or with fried rice croustades––which is how it was originally done. It would also be good with a green salad –– I would recommend arugula and radicchio to add a little bite to the mix. The dish is quite light and a real showstopper for a fancy luncheon party. Bring the stock up to a boil. Put the chicken in the stock and bring down to a bare simmer. Cook the chicken until done, about 20 minutes. Remove the chicken from the stock and cool. Strain the stock. Skim the fat and add enough water to make 5 cups and cool. Take the chicken breasts and slice into 6 slices (3 each), around the same size or into 12 squares… whatever suits your fancy. Reserve the rest of the breast meat and dark meat… chopping it up. Put 1 cup of stock in a pot. Add 5 envelopes of gelatin to the stock and let sit for 2 to 3 minutes. Pour around 1/2 of the clarified stock (measure out 1 ½ c + 3 T + ½ c for the other uses) into a 9” square pan and refrigerate. When solid, cut into cubes. If you need more for your medallions, just warm a few cubes –– use the rest on the plate on which you serve the chicken. It’s really best and most beautiful when it’s silver… china doesn’t work as well because you lose the reflective quality. Melt butter, add flour and cook over very low heat for 2 minutes. Add the stock. Cook for 10 minutes over low heat. Add the cream, boil gently for 2 minutes, stirring well, then pour through a sieve. Put 3 T gelée in a processor (warmed to liquid state, but not hot). Add the leftover white meat and dark meat, foie gras, cognac and truffles. Process for a few pulses. Whip the cream and fold into the chopped meat mixture. Taste for seasoning. 6 very thin slices of carrot, blanched and cut into floral shapes (an Exacto knife works well for this). Take the chicken medallions and spread each with the mousse. Place in the fridge, mousse side up to harden. Remove the medallions and spoon the warm Chaud-froid sauce over the side of the chicken without the mousse. The surface will become a smooth surface. Place the leek leaves on the chicken with the carrot pieces, dunking them in warm gelée before placing them on the top… surround the shape with long pieces. Allow to chill for ½ an hour, then spoon warm gelée over the surface and chill. Serve on a bed of gelatin cubes. I am now one of D'Artagnan's "chefs".... along with Mark Bittman, Dorie Greenspan, Marcella Hazan, Patricia Wells, Melissa Clark and, well, the list is blinding... what an honor to have my recipes included! See it HERE. Oh lucky you to have such a wonderful book, and with such memories attached. This dish is a work of art. Wow. I loved reading about the Time Life series. Check Ebay is now on my To Do list..
Vintage cookbooks are my reading material of choice. I find that in addition to fantastic food (which was so much more of an actual artistic process back then than it seems to be with many cookbooks today), the books tell so much about culture from the era that they were written in; it's really like a two-for-one for me. Your Poularde a la Néva is inspiring...I must get my hands on some of these books! This is a classic, show-stopping recipe. We didn't have the Time Life books (we were learning the basics from the Betty Crocker Boys and Girls Cookbook! ), but now I am incredibly curious. This series sounds like a feast! Congratulations on being one of the chefs. That's really exciting. This chicken looks so pretty, I think I'd be scared to eat it...At least for a minute. So much of interest here. Your mother sounds a delightful person and you obviously have great memories. I am so impressed that you are now one of D'Artagnan's "chefs". Well done and congratulations is certainly in order. I was in a hurry to scroll and see your take:) But resisted the temptation and read..and saw..and then WOW..What a feat you have accomplished..So perfect for your blog! Oh we had Time Life books too..I wish we had kept some.. Your mom was a reader like my mom was..
PS Congratulations on being a true CHEF!Well deserved..you put your heart and soul into your recipes. First of all, congratulations on your Chef status at D'artagnan! Very impressive. But, all of your recipes are impressive :) This one is not an exception. What a beautiful presentation, Deana. I have some of those Time Life books I inherited from an old, Rosarian friend, who gave away all of her cookbooks. I love Pierre and Craig - so much so that I think of them on first name terms! I have a couple of cookbooks authored by each of them. Yours sounds like a terrific selection. I'm so glad Petunia helped jog your memory (ha-ha) for this one! There was a Saint named Theodore at the shelter here recently. I saw his picture in the paper. He was already adopted when I dropped by to see him. Since my dearly beloved isn't ready for another dog yet, it's probably a good thing Theodore had a new home. This art, like many other forms of FRENCH EXPRESSION is the reason why I even studied French. What other culture has made a dent in culinary history that can compare to the French who give food a spirit, a dimension, as well as flavor? Many new culinary cultures have risen to compete and even surpass French cuisine, but let us always look back to see this rich influence! AND DEAR ONE,thank you for coming to visit me. I am not satisfied with this post; I have been so busy with school and fatigued that my creative juices are simply not flowing. BUT....do it 'til you get it right, and I love what you said:".....until the world whispers, 'YES'." I hope one day I will hear that whisper. You're now a D'Artagnan chef, Deana? What fun! I am thrilled for you. Congratulations! I well remember the Time/Life cookbooks....and yes, they were wonderful. Young cooks often forget...no internet back then. 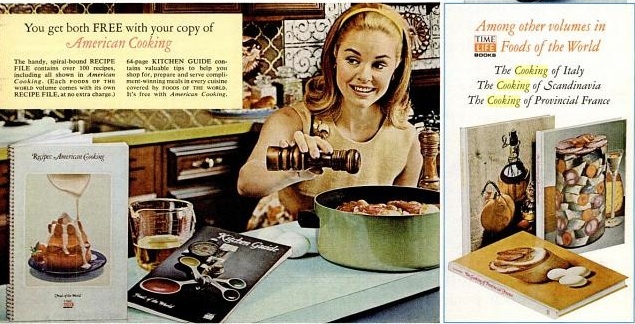 Cookbooks and magazines were how we found every new recipe. Or word of mouth. I have the HUGE orange Life Picture Cookbook from the 50's and another from the 70's called Great Dinners from Life. Some of our favorite recipes are from that orange book, which is looking quite ragged. While I may have inherited my love of cooking from my mother, she wasn't a big reader. My father was though. All three of my kids are too. I'm never happy unless I have a book in my hand. Your mother sounds like a gem and I thank you for sharing your memories of her. Now as to today's recipe: you fussed. :) What a fabulous job you did, Deana. I love the cubed gelée. Your finished dish looks every bit as enticing as that cover! I used to photocopy a lot of recipes from the Time-life books; your mom sounds like such an altruistic lady; the first photo of this dish I thought you made, well, the one you made looks really great! Congratulations on being included in that fine list of chefs! I own a few of them: Russian (studied the language), African (Peace Corps), Scandinavian (ex-husband), and one really great sampler with several recipes from each of a dozen or so in the series. My son has made a specialty of the catfish stew from the Southern Cooking book. Deana you go girl! I loved seeing you on the D'Artagnan site! How wonderful is that...you deserve to be there and more! I am speechless looking at you gorgeous dish...you are really amazing to this simple home cook. I learn so much from you each time I visit. Congratulations on being named a D'Artagnan chef! This is exquisite, Deana. Too pretty to eat! I can only imagine the flavours. I was gifted the entire Time Life series books by a friend and in my moving I parted with the hard cover books (except for Italy and Spain) and only kept the recipe books. I regret that decision now. I love to read cookbooks and these are lovely. Congratulations on becoming one of D'Artagan's chefs! Now we absolutely have to make that trip that we've been talking about for years. Funny how we learned about the world before the Internet, eh? And how images from the time when we weren't constantly clicking to the next thing stay burned in your memory somehow ... not that I'm down on technology! It's just interesting. I remember those books, not that my mom ever cooked anything more ambitious that a pot roast. You are wonderfully crazy to have made this, I love it. Amazing and beautiful dish. Congratulations! My mom had an old cook book from her mother and she let me had this now. I learned so much from her mom's cookbook.